Here’s another fun family and food video for ya today! Gosh, I love these things. Being able to capture what we’re all like via video is one of my favorite things to look back on. They are a pain to make, but so so worth it! I hope you think they are helpful and somewhat interesting to get a peek into our lives, beyond the photos I share here. And on Instagram. ANYWAYS, this Mediterranean Greek Yogurt Dip is my new favorite thing to make. I’m a tad bit obsessed. I cannot get enough of feta or roasted red peppers lately that I’m shoving them into all.the.things. I’m even converting my kids over to the dark side! Mwahahahaha. 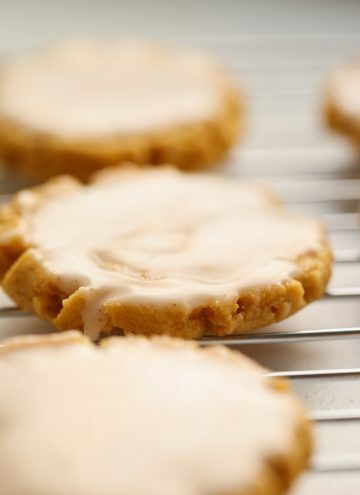 Get the printable recipe below and click play on that video again and again! Hope you like them as much as we do! Spread plain greek yogurt over a shallow serving platter or dish. Sprinkle with salt and pepper and using the back of a spoon, swirl seasonings into yogurt. 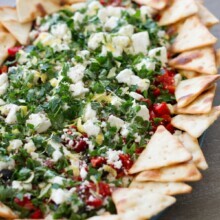 Top with olives, chopped roasted red peppers, feta cheese and parsley. Squeeze lemon juice over entire thing. Sprinkle with lemon zest, drizzle with olive oil and top with more salt and pepper. Serve along side pita chips. Yum- this looks delicious and such a cute video! What is the song that’s playing if you don’t mind me asking? It’s called Let’s Go by Handsome and Gretyl. Really fun!! I LOVE your videos! This one was so sweet. I loved the part where you had Gordon open the red pepper jar ha ha! I’m putting together some treats/snacks for the ladies at church this Sunday and this would be perfect! So pretty, sounds delicious! I always struggle opening jars. Haha!! Hope you enjoy!! I love all dips! This looks yummy! I am definitely making this for Christmas Eve, we need something colorful, tasty and and healthy to balance out the richer food…and I love it! I have already eyed this recipe to take to a New Years Eve party. I love roasted red peppers, as well as, olives. I plan on using Kalamata olives. I’m looking forward to it!! Thanks!! No garlic in this? Seems like this dish would need it, at least in my house. This looks great. I’M going to make for my daughter who does not eat meat and loves this kind of stuff. Oh boy, oh boy, oh boy! I can’t wait to try this. We love all things with these ingredients. I am going to tried baked tortillas with it, as I have so many on hand. Yum! Also this is my give away post!!! Hugs for Christmas! Looks delish, what a fun and different dip from the usual dips that I tend to gravitate towards to! Will have to give it a try!! I made this over the weekend and it was a tremendous hit with everyone! This looks beautiful and healthy! Making this for our Christmas Day appetizer. Love all things Mediterranean! Loved the video and the recipe. Feels great to be able to get back to eating healthy. I’m making this for a me day first and then for New Years! Can’t wait! I’m definitely saving this recipe. It looks amazing! This would make the perfect appetizer for Christmas. Thanks! 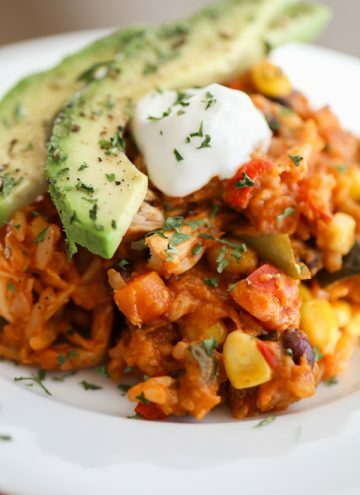 This recipe sounds healthful, tangy and absolutely a must try. I will have to omit the red pepper – hubby can’t tolerate… but I wonder if a little sundried tomato might take the place for the ‘red’ colour. … Olives and sundried tomato? Might work. Cant wait to try ! Mediterranean dip is so yummy! I just printed this recipe to make as an appetizer. Quick and Easy with flavors I love!! Can’t wait to try! Looks awesome & festive with the red and green! Lauren, this looks so delicious. I also, am making this for Christmas Eve! I love your recipes, have made many of them, but my real attraction to you is you are a fellow Idahoan! I don’t live in Boise anymore, but was raised there and went to Meridian High. (Lived right by Capitol High School). Miss my Idaho!! This dip looks amazing and love the video! Can’t wait to make this dip for New Year’s Eve! Perfect for a Christmas party! Have this pinned to try very soon! Can’t wait to try this as a Christmas appetizer! Ok, I am building an entire dinner party menu around this dip. I can’t wait! Making this for Christmas Eve! I’m excited to try this…anything with feta and kalamata olives and I’m in heaven!!! Ooohhh this looks yummy! Love olives ???? I love the Greek Yogurt dip, its festive and delicious. Yum! This dip looks delicious and a perfect festive appetizer for Christmas. I cannot wait to try it out! going to be making this for christmas dinner nosh, can’t wait to see how it turns out! thanks for the recipe! 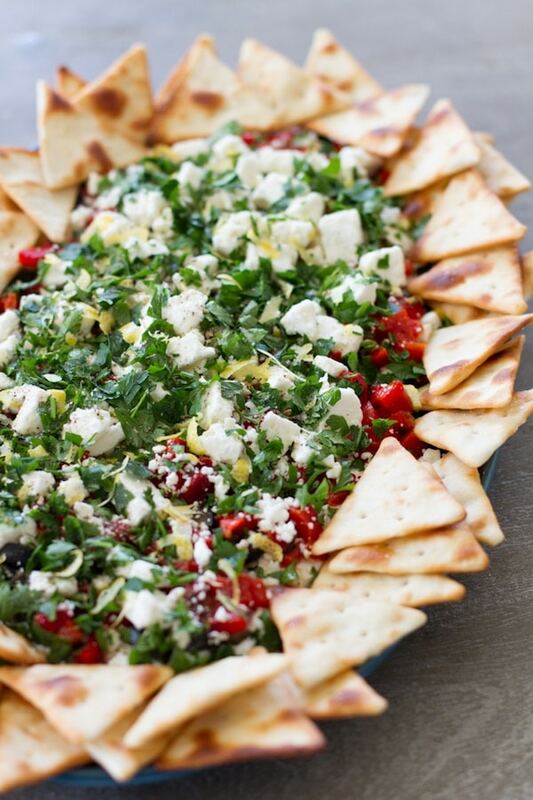 feta has won me over the last couple years and the rest of the flavors in this dip look incredible as well. I know my husband would love it even more! My inner Greek Goddess says OPA! This is such a pretty recipe for parties and holidays. 🙂 Thanks for sharing. This is going my list!!! Love the video! This looks amazing for Christmas Eve appetizer! Buying ingredients today. Might dub crumbled goat cheese for feta because I like the taste a bit better than feta. This looks amazing! I have a picnic this weekend and can’t wait to make it! Oh my goodness, this looks delicious! I am on the search for something to bring to a potluck our friens are having and this looks perfect. Thank you! This sounds delicious and so easy to make! I just added the ingredients to my grocery list to stuff my face with it this week as a snack! HAHA! Love your recipes!